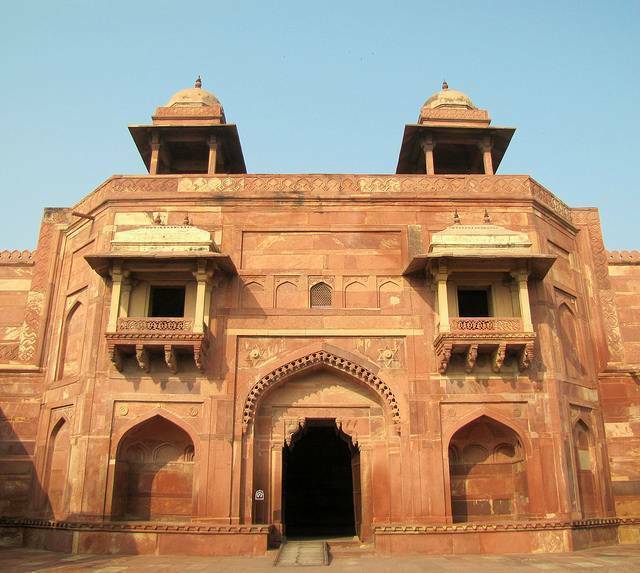 Located in Fatehpur Sikri, Jodha Bai Ka Rauza or Jodha Bai’s Palace is around 12 kms from Taj Mahal, Agra. This ‘Rauza’ was built by Akbar for his favourite Rajput Queen – Hira Kunwar or ‘Jodha’ as she is now popularily known. The marriage took place as part of a truce deal with the Rajkumari’s father, the then-King Bhar Mahal of Amer in exchange of recognition of Akbar as their King. Rajput Kings took pride in giving away their daughters’ hand to Mughal Emperors to boast of familial relations with the King. Akbar was greatly secularist in his ideals, allowing Jodha Bai to worship Lord Krishna even after her conversion. Thus, Jodhai Bai ka Rauza emerged as the perfect example of this Hindu-Muslim religious and architectural fusion of the sixteenth century Mughal era. The name ‘Jodha Bai’ is however a misconception simply passed down by folklore. It has been largely agreed that Akbar had no wife called Jodha Bai and there is no mention of her in Ain-e-Akbari or Akbarnama or any of the existing historical memoirs. The name now purely stands for a representative figure and the Jodhi Bai’s Palace - symbolic of strong, religious fusion and a politically established Hindu princess in the Mughal era of Indian history.